You are seeing the thumbnail of an animated card waiting for you over on my Facebook page. The festivities in the town square here are set to the tune of Sousa’s Liberty Bell March. The tune, famous in the 1970s as the theme song for Monty Python’s Flying Circus, accompanies the ringing of the Liberty Bell in my holiday greeting to you. Jacquie Lawson, designer of elegant, animated cards for all occasions, is based in Sheffield, England in the United Kingdom. Incidentally, on July 1 Jacquie featured a maple leaf-studded flag for Canadian readers. To all my Blog viewers and followers around the globe – Happy 4th of July, however/whenever you celebrate independence & freedom. Click here to find your card on my Facebook page. What does liberty mean to you this year? A definition, a story, whatever is on your mind . . . Previous postI Spy an Elk! I saw this picture on Facebook but couldn’t leave a reply (I’ve been having trouble with FB lately). 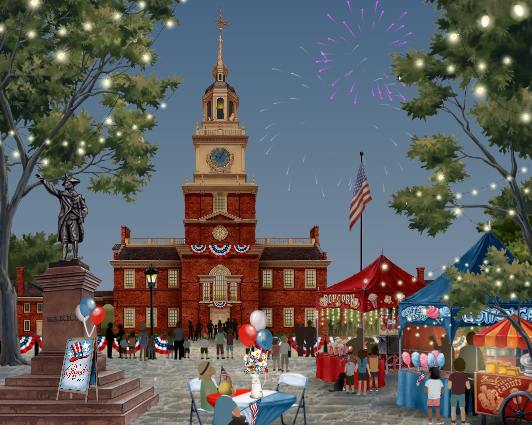 It’s a colorful post-card image of how I remember 4th of July celebrations when I was growing up. Not the specifics, but the feelings. When neighbors greeted each other, talked, shared their picnic meals and looked out for each other’s children as they waved around their sparklers in the dark. Happy Fourth, to you and your family, including your famous Ma! Good morning, Marian! Happy Independence Day! I love Jacquie Lawson’s cards–ever since you introduced them to me about a year ago, I think. Maybe it’s been longer? I couldn’t view this on your FB page though. I’m in the midst of finishing going through my page proofs for my World of the American Revolution. If we hadn’t won the war and become the US, I guess I wouldn’t be doing that book! I had a hard time posting the card to Facebook, but eventually I could see it. I wonder whether it came through as a private posting because of Facebook’s new “permissions” policy. Thanks for the tip about the card. I will try again to post it! Thank God, we won that war! I look forward to your special Fourth of July post! How cute and special is that! Happy 4th, hope your family gathering is fun. I hope the card played for you on Facebook, Terry. Some have said they couldn’t see the animation. Beautiful card and it did play for me on Facebook. Happy 4th!! Wonderful! Hugs to you and Bill. A group hug, ha! Thanks, Laurie. I have never thought of Jacquie’s cards as eco-friendly, but so they are. And so creative too. I know you have grown to love Bertie and all the kitty cats. No competition for Willa, of course! Hope you and Len are having a Happy 4th weekend too. 😉 Happy Fourth to you, Sage, and Hubby too! Sorry Marian I am a day late but still have your wonderful country in mind . Happy , happy ,happy 4th July for yesterday ( hope it still counts) . I love your photo of face book and the lovely card from the English lady thank you for that . Freedom and independence mean everything to me . It is the very reason we a put on this amazing planet . I fear for the people , especially women , in countries of the world who don’t have what I believe is my right as a human FREEDOM …let’s all celebrate it . Of course it still counts – we celebrate all weekend long, Cherry! Yes, Jacuqie Lawson is an English woman from Sheffield, something I didn’t know until I read the back story. No wonder I love her brand of cards. She has an amazing staff of creators and skilled animators. Yes, many in our country believe too that lack of freedom and access to education for women is a major world problem. I’ve seen comments from both politicians and writers lately on the topic. Happy Independence Day Marian to you and family! We joined friends last evening – our host is an American – and had hot dogs and apple pie. I offered to bring pumpkin pie but that’s for Thanksgiving I learned. What a lovely and lively evening it was discussing everything under the son! Fantastic! I had to smile at your offering a pumpkin pie for the gathering. Pumpkins are not in season here in the States as they probably are in South Africa, so I can’t think that serving pumpkin would be a faux pas. That’s a lovely card image indeed. Hi, Shakti, I just perused your post and listened to the clip – both a great commentary on the value of context. Apparently you also enjoy satire as much as I do. Thanks for reading and commenting here; I so appreciate it. I’m a day late. Love your post. We’re in Indiana at Julie’s.Every year she hosts the 4th of July and everyone brings food and drinks. We got here on Friday and were still here cooking and eating. We had more than 60 family members and friends. Hope you all had a great day. Commenting any time is fine, Gloria, and I love hearing from you. Your family certainly knows how to celebrate. I hope you have tomorrow off; otherwise, it’s a long drive back to Illinois when you might get drowsy after all that food! Yesterday we had a small gathering of just the kids and grand-kids – 9 all together. Cliff had a chance to show video clips of his father’s memorial service, the Grandpa Beaman they never knew. After dessert, they all received mementos including toy car replicas and harmonicas from Grandpa Lee’s large collection. They each left with a gift bag full of remembrances, sort of a Christmas in July. Jackie Lawson has the most amazing cards! And for ALL occasions too! Happy belated 4th, Marian. I’m just catching up. Love the card, especially since it has a Golden Retriever participation in the celebration! I love Bertie too, my favorite breed of dog. He/She appears on many of Jacquie’s animated cards. Just now I left a comment on your post this week. You know how much I LOVE, LOVE, LOVE color. Thanks for commenting here today. I always attach a voice and a kindly spirit to your face. Thanks for the lovely reminder of my magnificent Independence Hall in Philadelphia. It’s a great part of the city, too. I’d bike over there now and again in the first few years I lived there, back when everything was new to me. Those were the days. You have had (okay, it’s still happening!) a life filled to the brim with adventure – and plenty of independence and joy! Thanks for appearing here again, Janet.